It’s August now, so I feel like I need to pack in as much stuff every day as humanly possible. I will not let the rest of my summer go to waste! 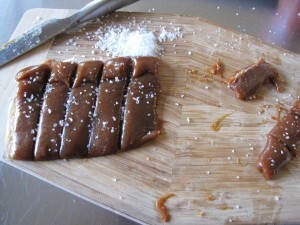 Anyway, after my newly discovered obsession with salted caramels, Adam suggested I learn to make them to save our wallets from my monthly fix at Galipette. So yesterday, I did. For a first attempt at making caramels, this turned out pretty awesome. But there was a very slight burnt aftertaste to them, so next batch I will cook the caramel a little less. The texture was absolutely perfect, though. 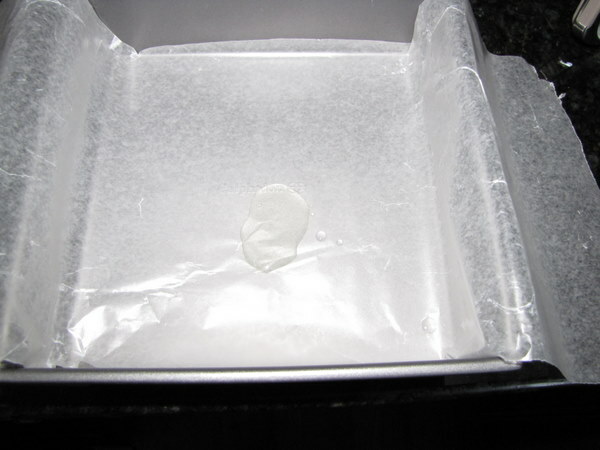 I took it off the heat at about 300 degrees F.
Line the bottom of an 8-inch square baking pan (or loaf pan) with parchment paper, then brush the paper lightly with oil, allowing the paper to drape over 2 sides. 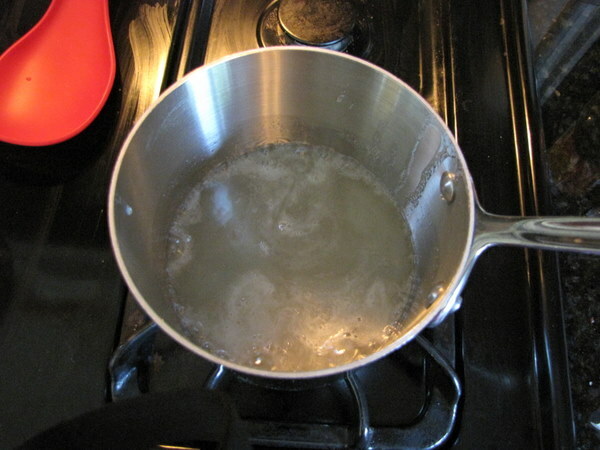 In a deep saucepan (6 inches diameter by 4 1/2 inches deep) combine the sugar, corn syrup, and 1/2 cup water and bring to a boil over medium-high heat. 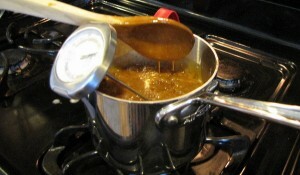 Continue to boil until the caramel is a warm golden brown color. Don’t stir – just swirl the pan to mix. 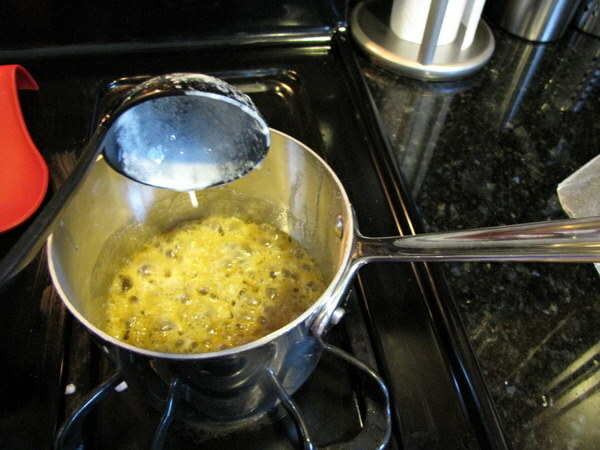 **I boiled it for about 10-15 minutes, until the candy thermometer read 300 degrees F. Then I turned off the burner. Next time I will take it off the heat maybe at 295, since the sugar doesn’t cool down instantly. 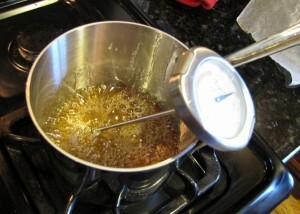 When the caramelized sugar is the right color, slowly add the cream mixture to the caramel – it will boil up violently. ** had no heat on for this, and it was a big boil. I used a soup ladel to pour slowly and keep from scalding myself or having the pot boil over. Stir in the vanilla with a wooden spoon and cook over medium heat for 5 to 10 minutes, until the mixture reaches 248 degrees F (firm ball) on a candy thermometer. Very carefully (it’s hot!) 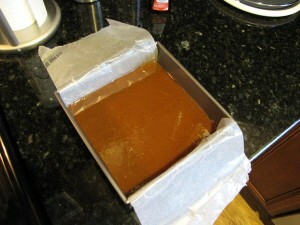 pour the caramel into the prepared pan and refrigerate until firm. 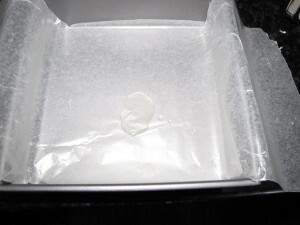 When the caramels are cool, use the parchment paper to pry the sheet from the pan onto a cutting board. 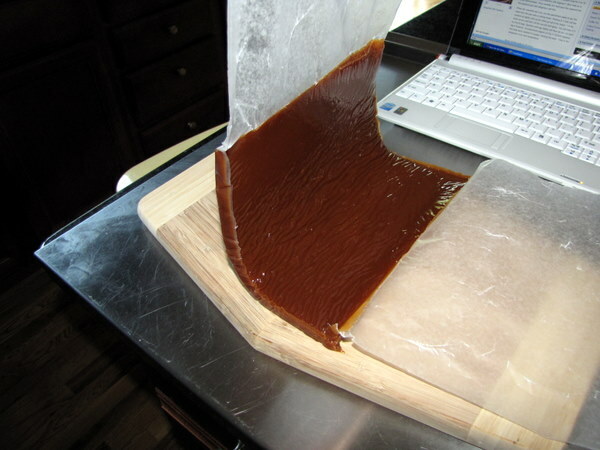 Starting at 1 end, roll the caramel up tightly until you’ve rolled up half of the sheet. Cut the sheet across and then roll the second half tightly. You will have 2 (1 by 8-inch) logs. Sprinkle both logs lightly with fleur de sel, cut each log in 8 pieces. Cut parchment papers in 6 by 4 1/2-inch squares and wrap each caramel in a paper, twisting the ends. Store in the refrigerator or at room temperature.